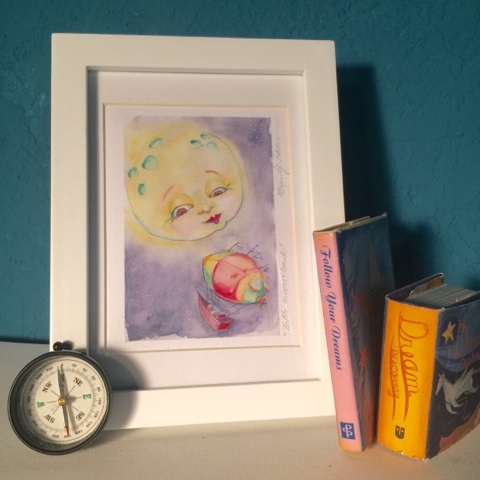 This past summer I participated in World Watercolor Month. I painted a different, little watercolor painting every day of the month. As the month went along, I had friends and family inquire about purchasing some of the paintings. I wasn't sure what to do with these offers until I noticed how many fellow artists had greeting cards available for sale at fairs and festivals. 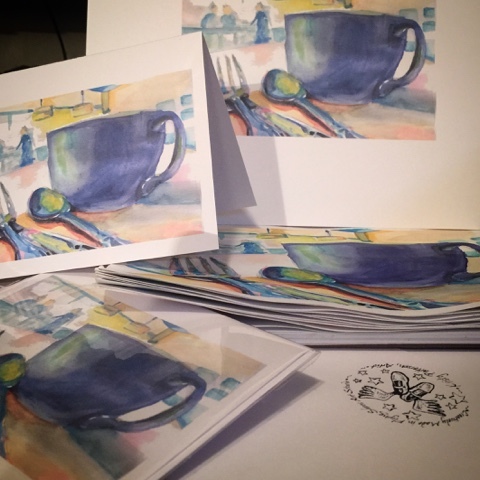 So I decided to reproduce my watercolor paintings as greeting cards. It's taken lots of hours to scan, format and reproduce the most popular paintings as greeting cards. 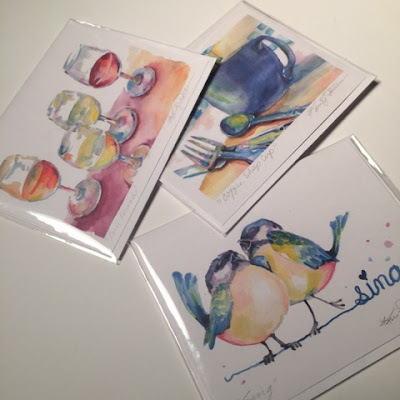 I have had a successful Etsy shop for prints of my dictionary drawings for years now and knew I didn't want to complicate that shop with something so different so I set about opening a second shop dedicated just to my watercolor greeting cards. This challenge meant I needed to figure out packaging, shipping and create quality, digital images of the paintings and cards. I've learned that online sales require great photos and details about what you are selling. Painting these pieces was the fun and easy part but building a new sales line on my own and building a new shop is quite the undertaking. I did lots of research on pricing and studied established card shops and then spent long hours figuring out what I wanted to do. I pushed the button to open my new shop this past weekend. I only have 8 paintings available as greeting cards but plan to add more as quickly as I can - I have 31 plus paintings to reproduce and more ideas I want to paint. I package each card individually with a matching envelope inside a sealed, protective sleeve. I also personally sign and title each card like I would any nice print. It's taken a lot of trial and error but I think I have a professional product that will impress both the customer and their recipient. I also think these pretty cards would be great framed and displayed which makes them special and long lasting. The archival inks I use guarantee that the image will not fade or change color for over 200 years. I invested in an expensive printer long ago and it has sure paid off. 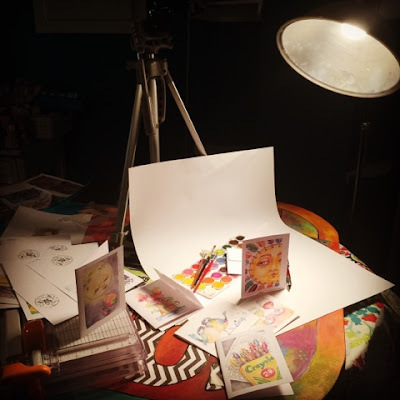 I discovered a number of other greeting card artists outsource their card production but I'm determined to do it all myself giving what I hope is a more personal touch. I'm excited to say that I am shipping out my first two greeting card orders today - only a few days after launching the new shop. I'm anxious to see how this develops and plan to include the cards in my future art shows. 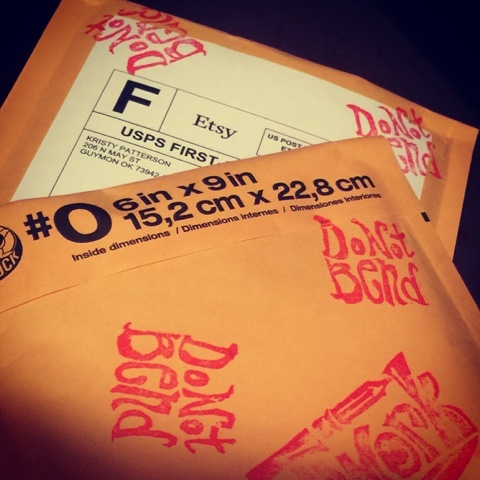 My first customers got a little extra in their order and a request for feedback about their purchase.